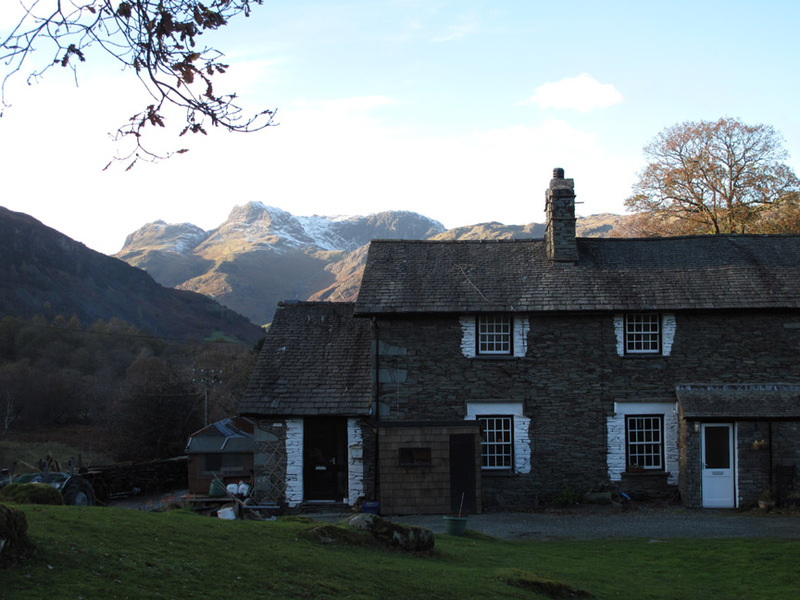 " Lingmoor ~ Sun and Snow "
Date & start time: Sunday 4th November 2012, 11 am start. 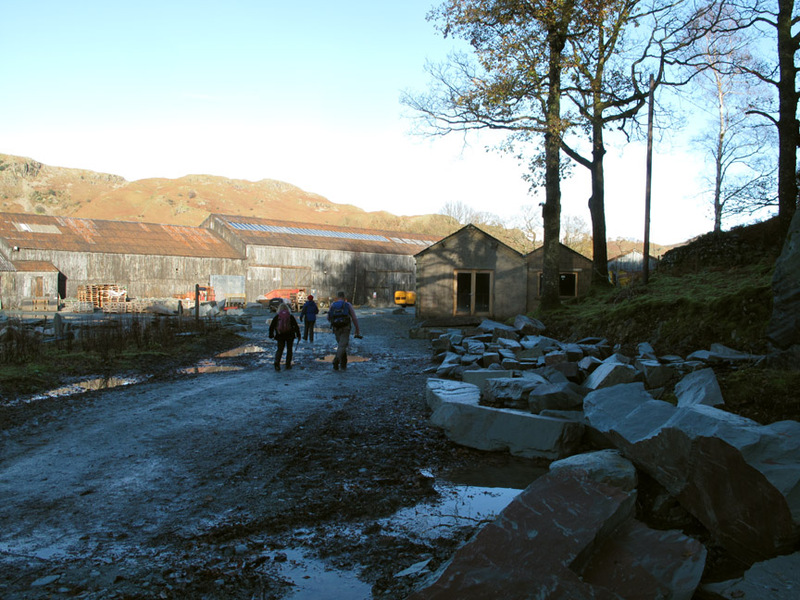 Places visited : Elterwater, Dale End Farm , Lingmoor and back down through the Burlington Quarries. 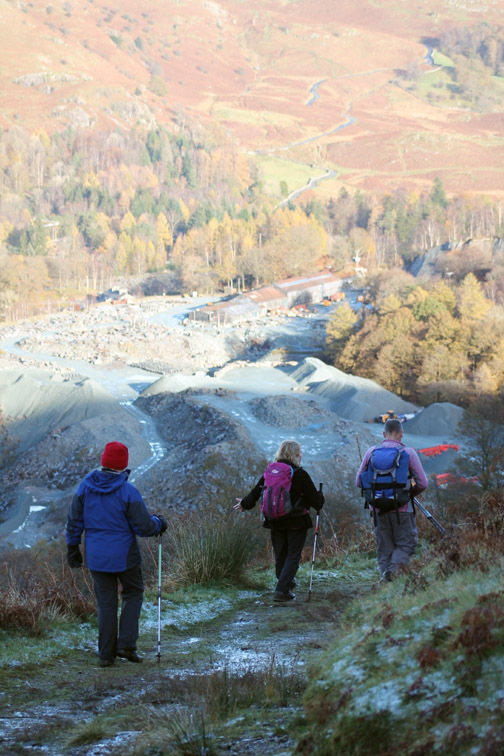 Walk details : 6.25 mls, 1550 ft of ascent, 5 hour 40 mins. 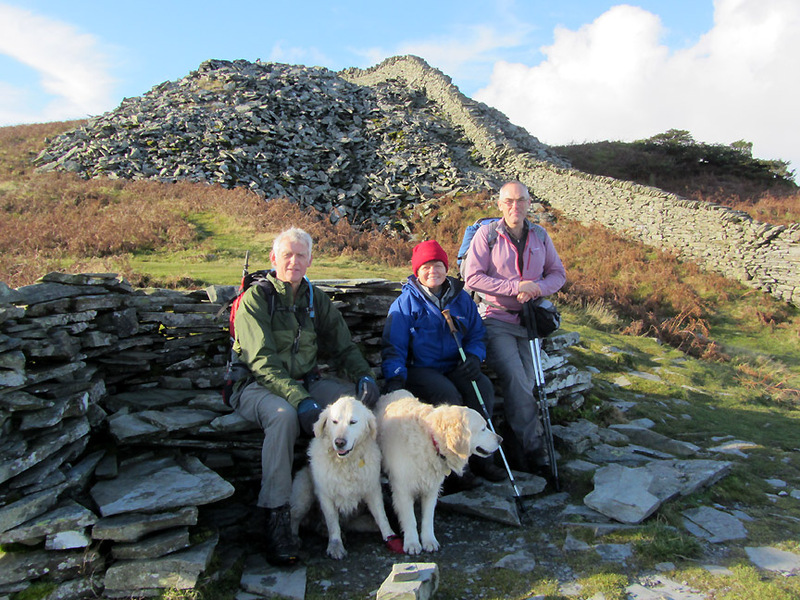 Walked with : David and Jennifer, Ann and the dogs, Harry and Bethan. Weather : Sunshine and blue skies all the way. This invitation to join David and Jennifer was planned several days ahead. 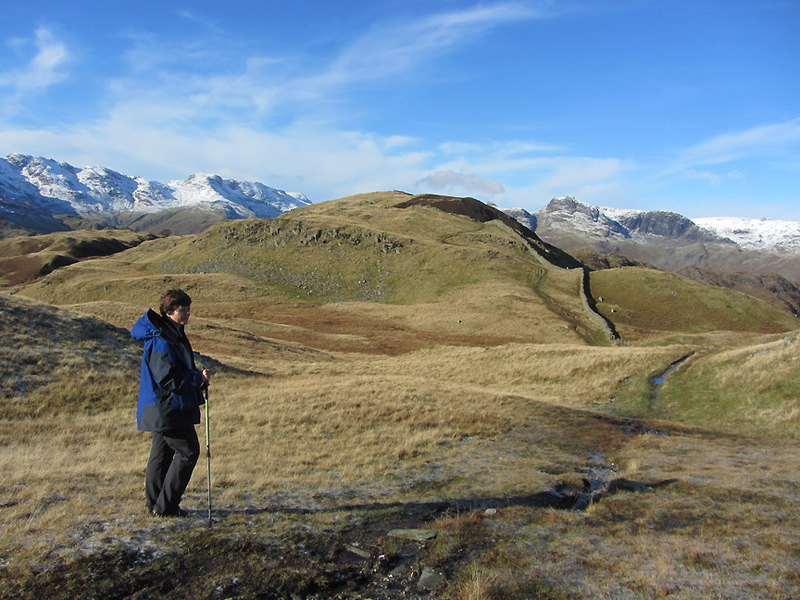 The forecast on Friday night was extremely poor but 24 hours later the weather charts had been turned on their head and a fine day was in prospect. 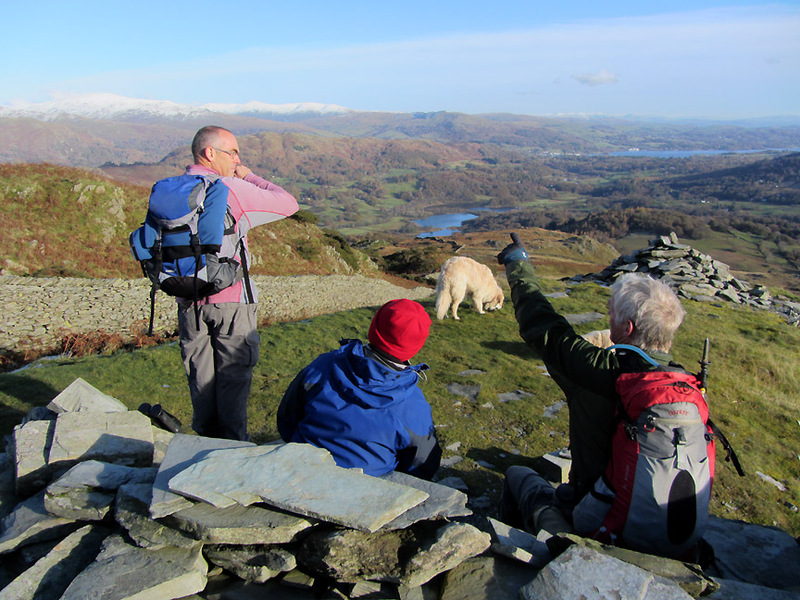 to a drive through the Lakes, a fine walk and lunch overlooking a panorama of southern Lakeland fells. A fine morning on a fine day. and the cold, morning air and general humidity has led to valley mist . 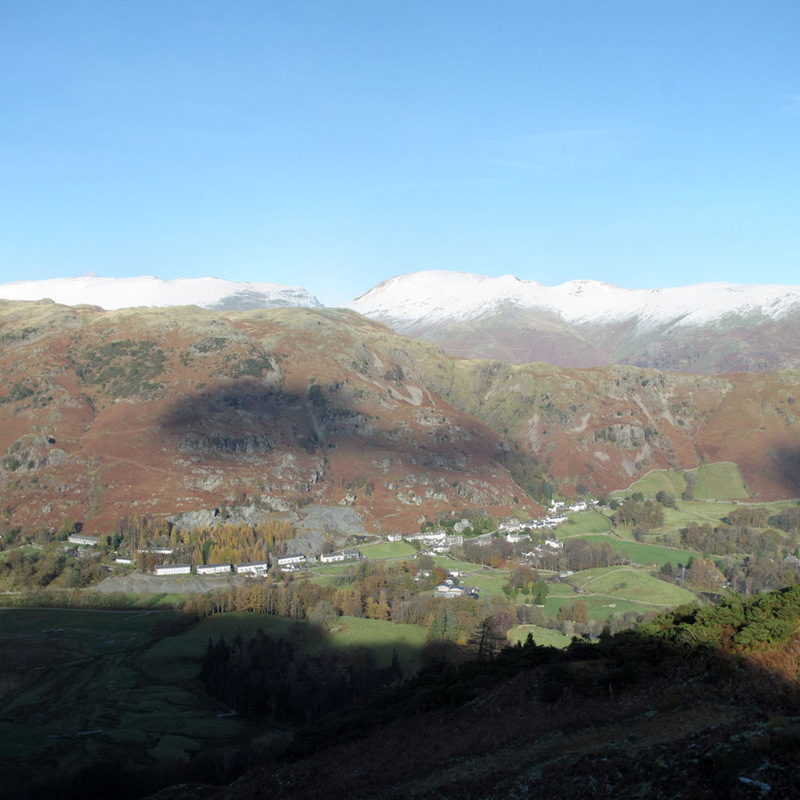 . . yet to fully clear from the vale of Grasmere. 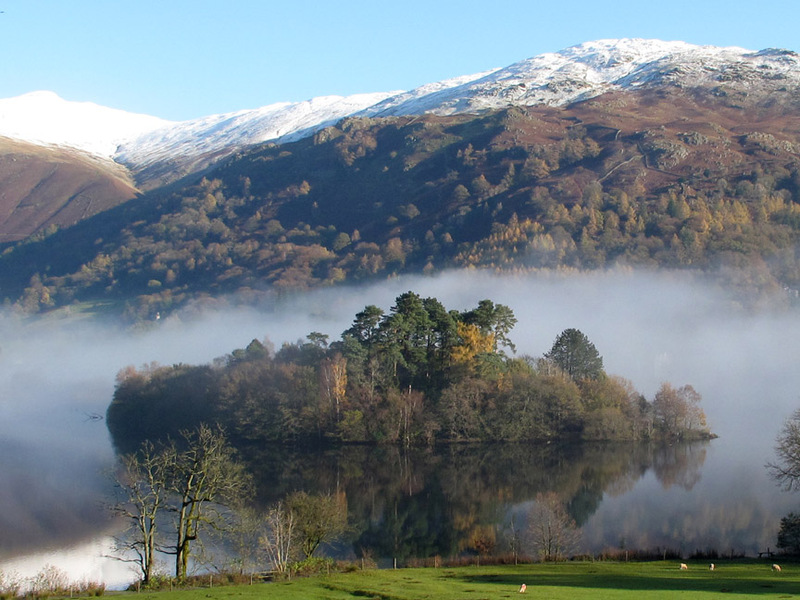 Zooming in on the island in the middle of Grasmere. 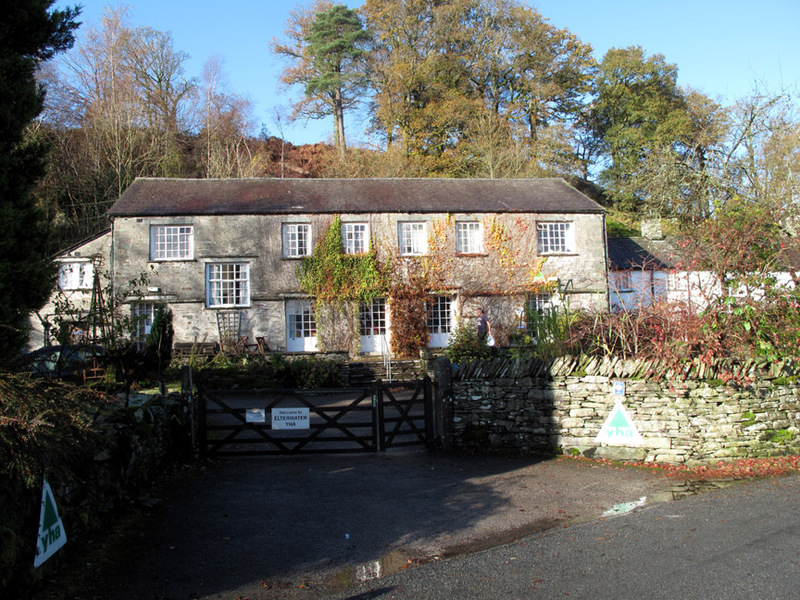 before we drive the steep hill up Red Bank to get over to Elterwater. 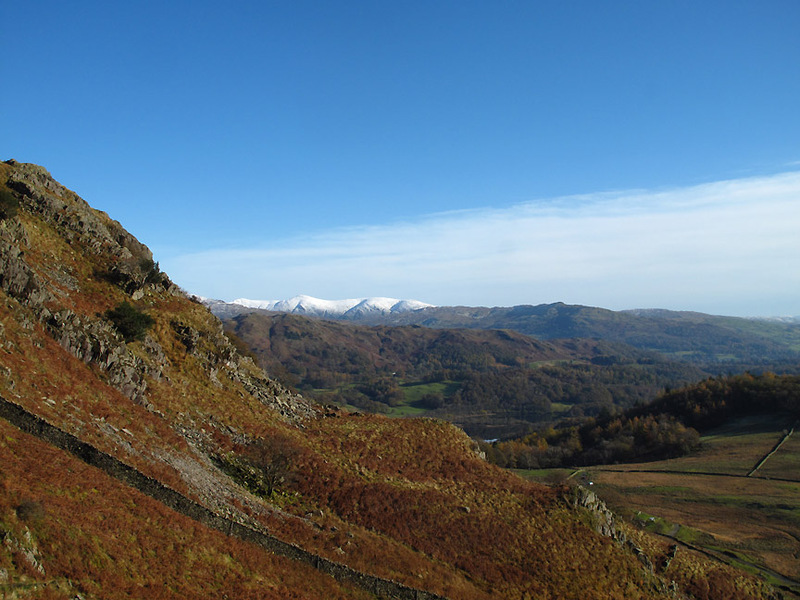 Over Red Bank, the view south now includes Wetherlam, again with a fine covering of snow. The valley here has the similar cloud inversion, slowly clearing as the heat of the sun builds. 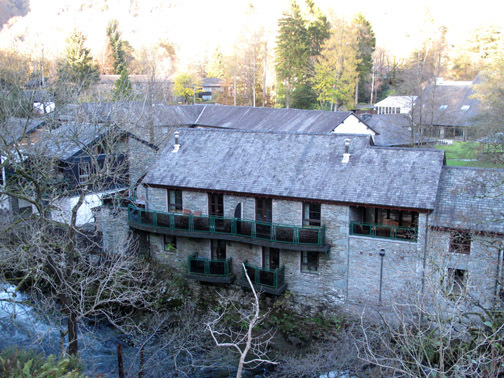 We have arranged to meet David and Jennifer Hall at the car park down in the valley. It's 10 o'clock and we're on time to meet them . . . just about . . . give or take a photo stop along the way ! 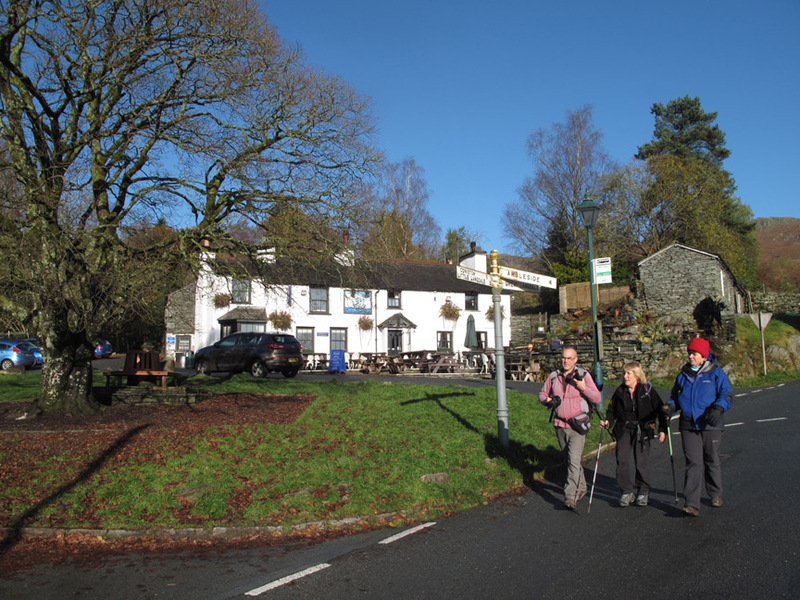 Parking at the base of Red Bank, near the main valley road, we head off into Elterwater at the start of the walk. The Britannia's Maple tree is completely devoid of leaves after the cold rain and the winds of the last few days. 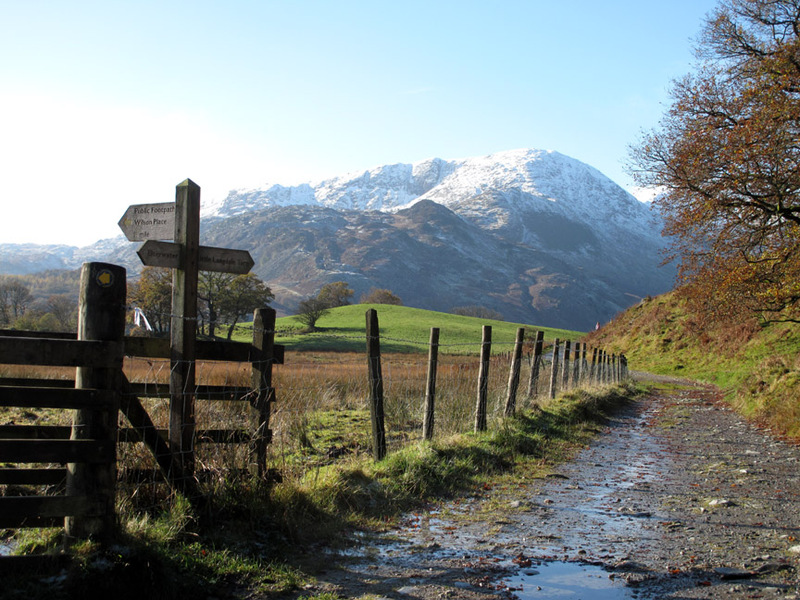 starting point for many a walker to this part of Langdale. 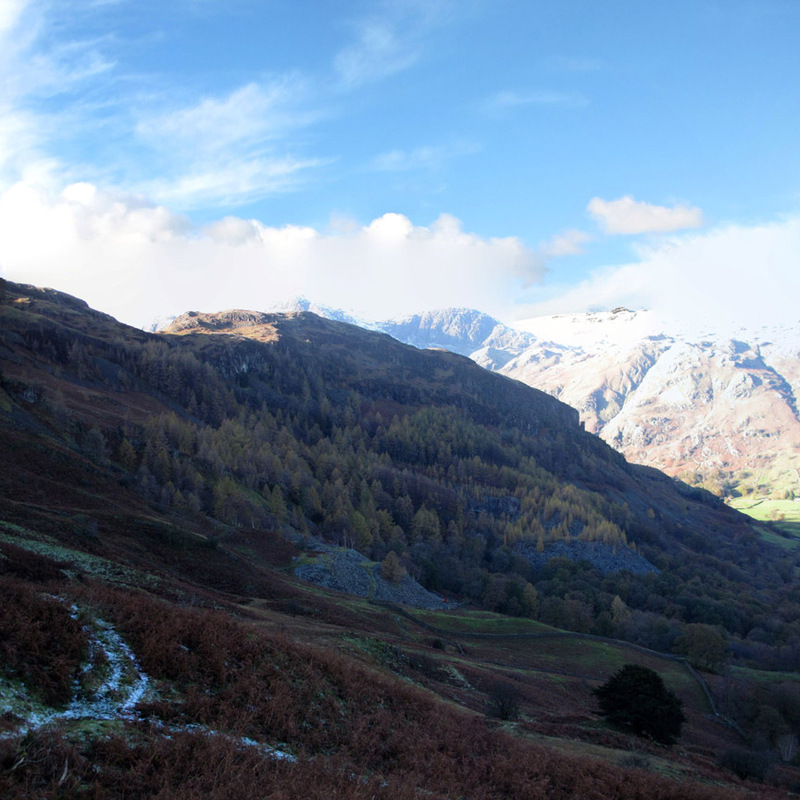 onto the unmade track heading to Little Langdale. 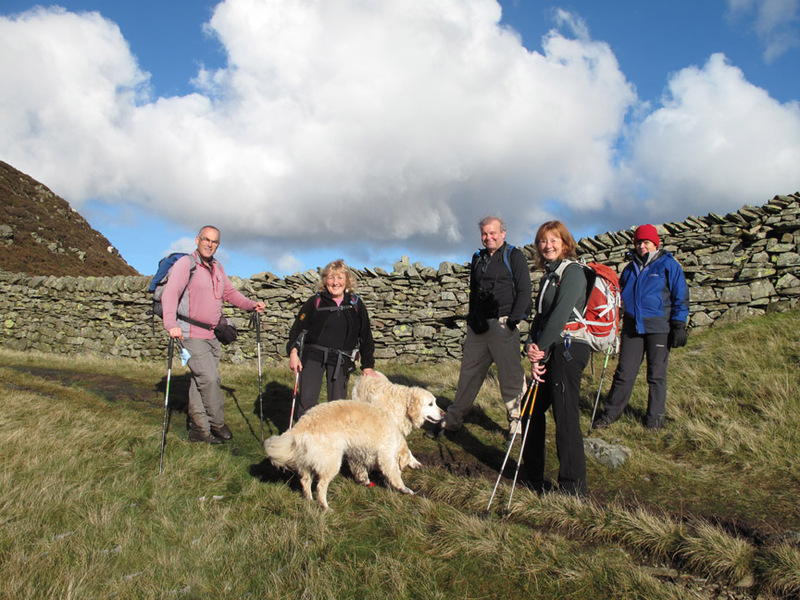 out to the open fell . 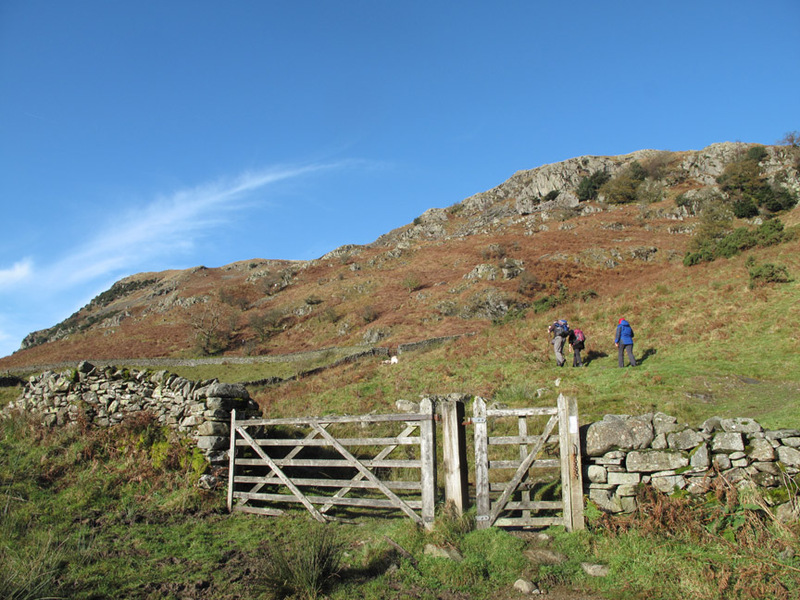 . . and onto the start of our climb today. 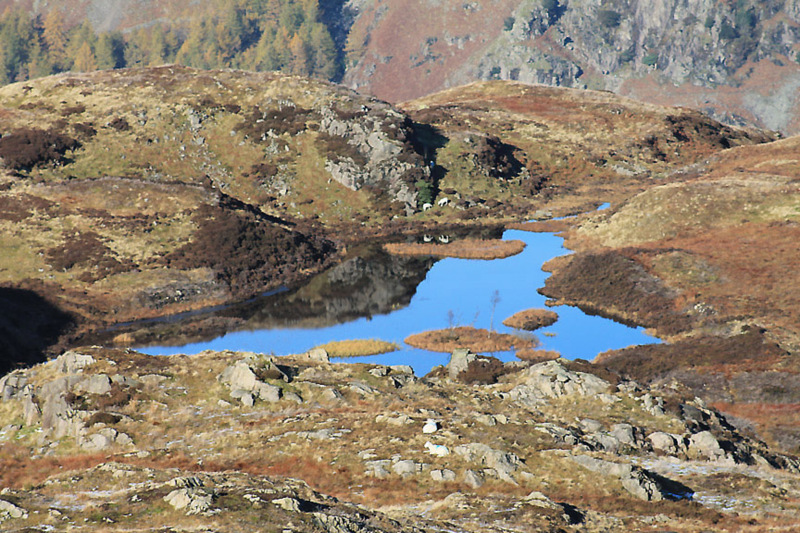 we get lovely views of Little Langdale Tarn and the Wetherlam / Swirl How group of fells. 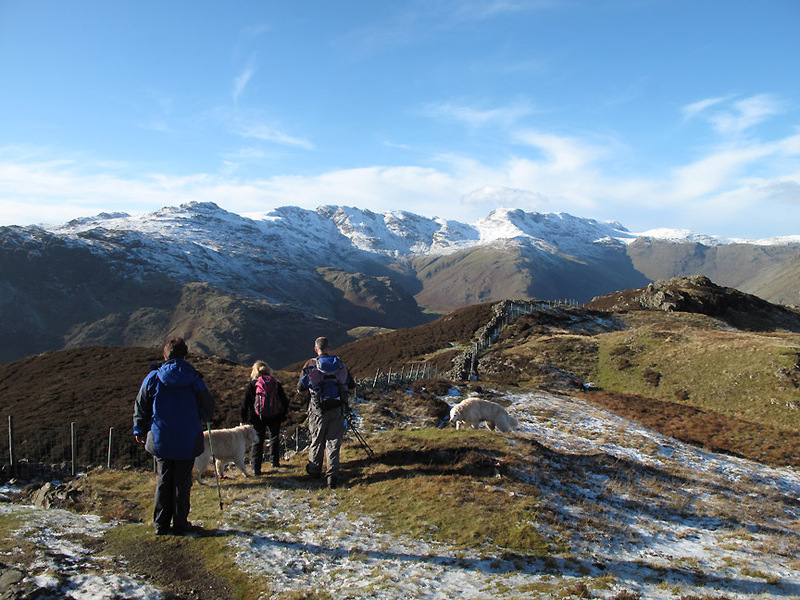 we look down on Elterwater and across to the snow on the Froswick / Ill Bell / Kentmere Ridge. 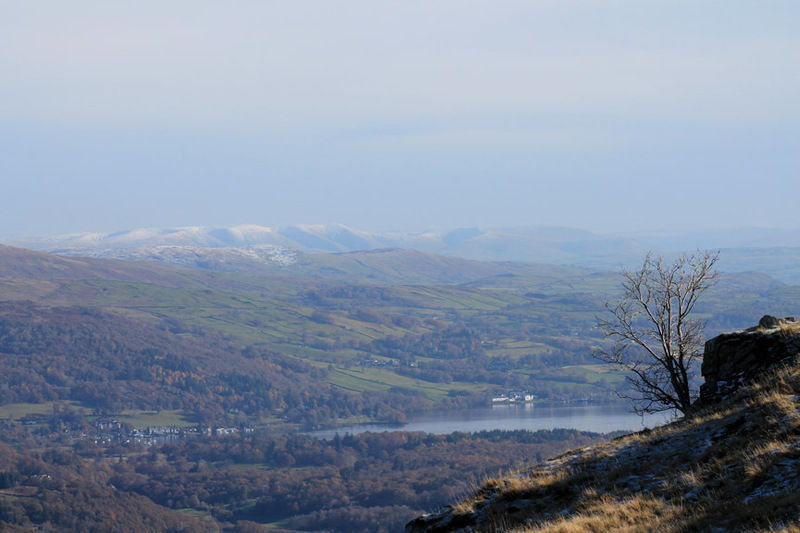 The snow line must be above 1600 ft ~ 500m as Wansfell above Windermere is clear of snow. 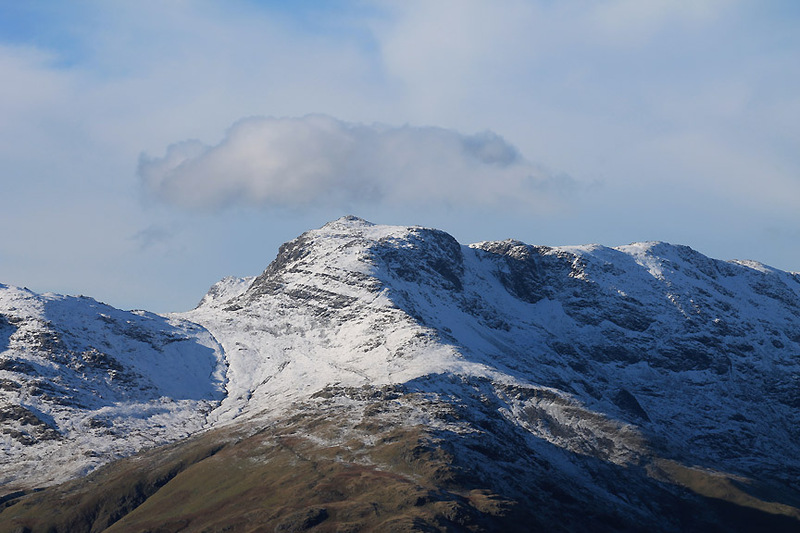 Great Carrs is higher than that and there's a fine layer of the white stuff up there. We're planning a visit next week on Remembrance Sunday . . . I wonder, will it last ? 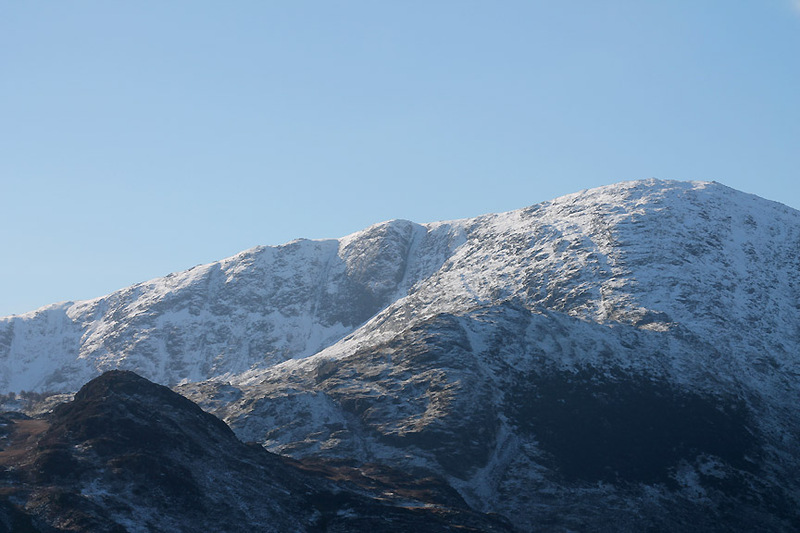 A close up of Wetherlam Edge. 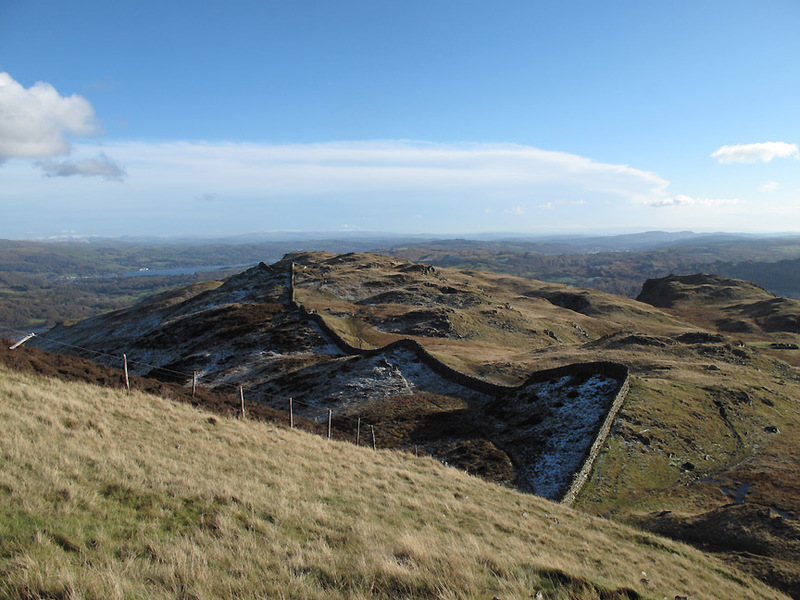 The ridge down to the left leads down to Lad Stones and the ridge towards us leads up to the darker minor summit of Birk Fell. and to the snow on the Howgill Fells the other side of the M6 motorway. Yes Ann . . . we did pass it on the way up ! Perhaps she was taking a photo of the three of us just above the seat so didn't really notice it. Looking west from the minor summit there's not a bad view either ! 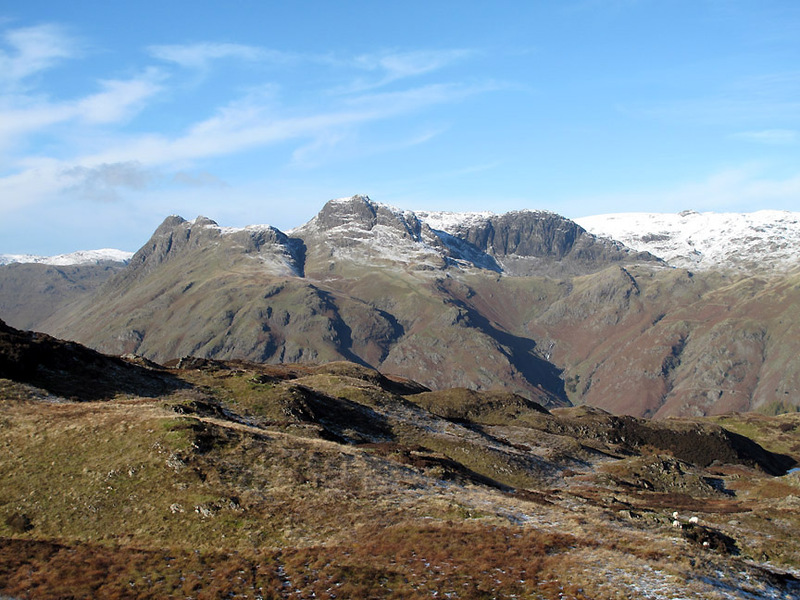 I had crossed over to get a view down into the Langdale Valley and to check out the whole view. 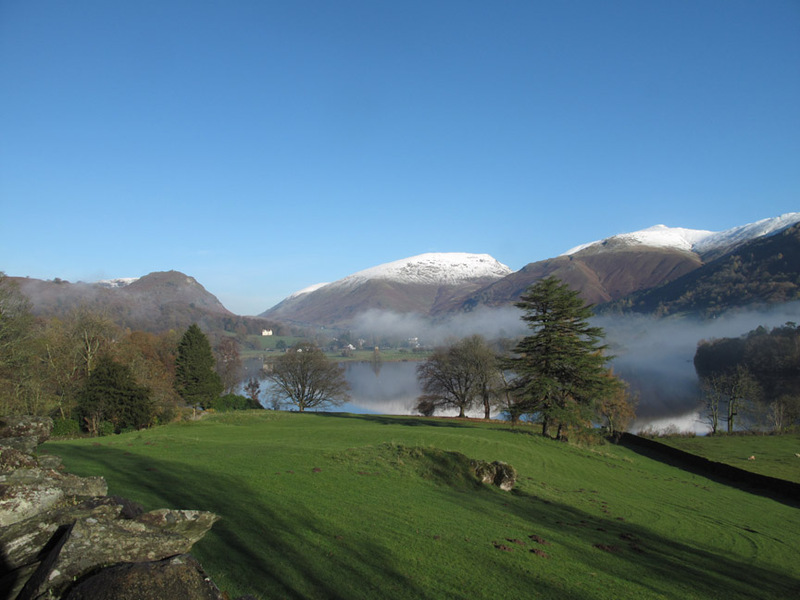 Click here or on the photo above for a Loweswatercam 360 degree annotated panorama from this first summit.
. . . and not forgetting the view I came across for . 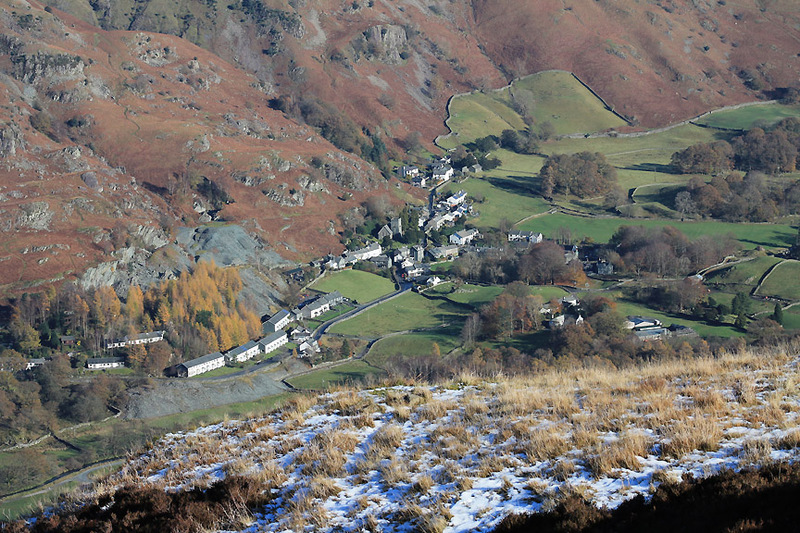 . . the view down to Chapel Stile village. 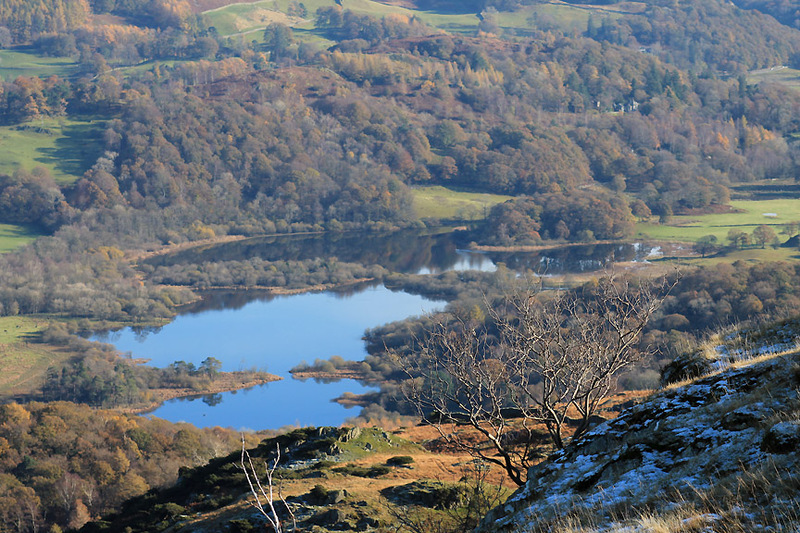 Elterwater from the same spot. 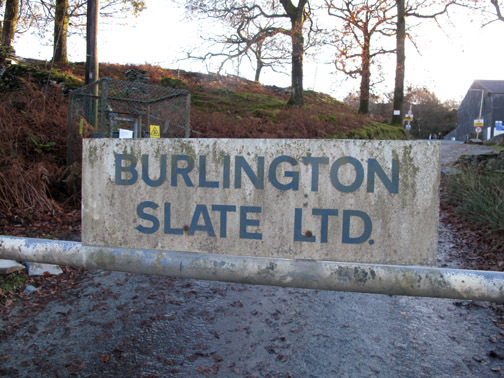 that have extracted slate from the side of Lingmoor over the years. which we hope to pass through on our return. Jennifer surveys the scene on this wonderful late Autumn day. 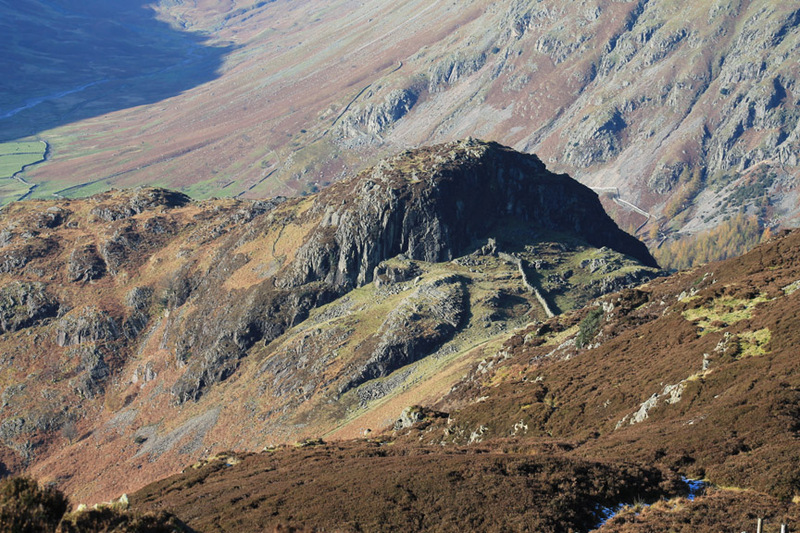 There's the Lingmoor wall trying to look as Chinese as it can. 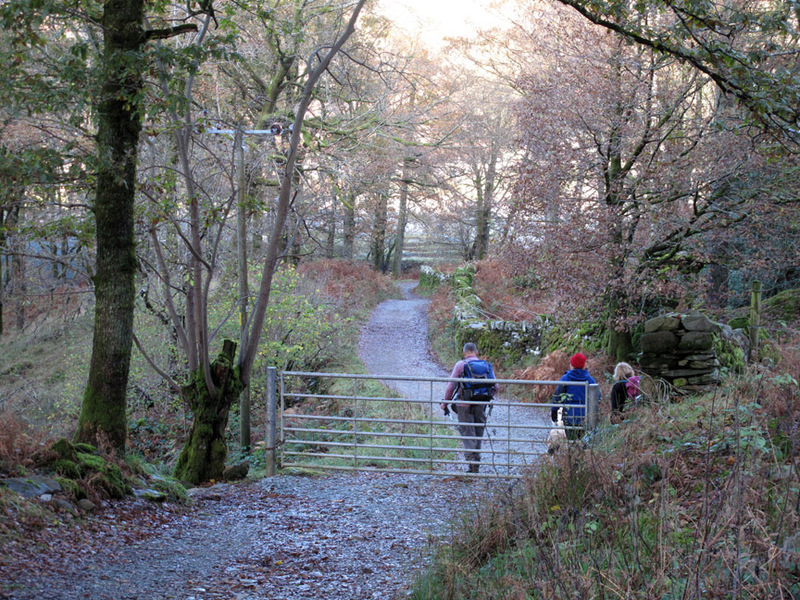 It follows the bumps as it is easier to build on the solid ground than take a more level track across softer ground. 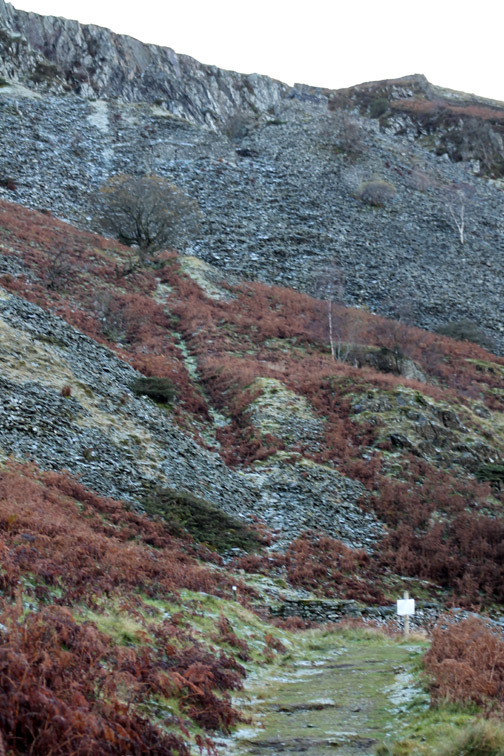 The unusual dragons-tooth effect in the underlying strata was probably the definitive boundary anyway. 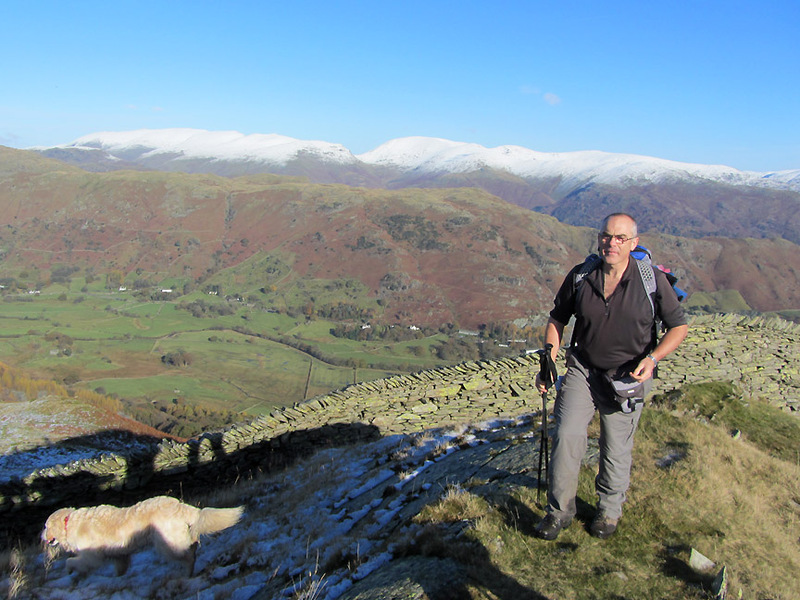 David taking a relaxed approach to using his walking poles. Wet boots give testament to the amount of damp ground we've crossed. 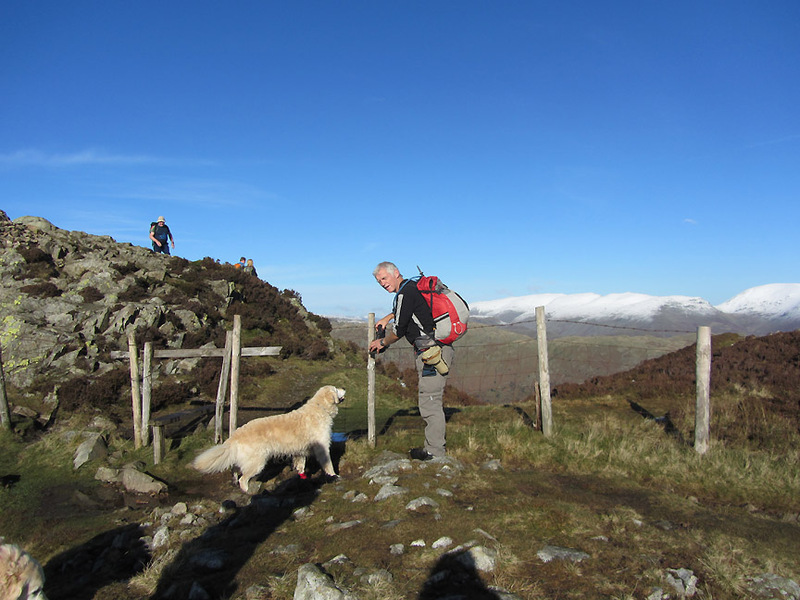 At the summit fence now . . . the wall having turned away a short while back. There was one old boot hanging on the fence . . . the other one we found sticking out of the bog we had just crossed. I wonder what the chap or girl was using for footwear from here on ? Across the rickety fence and a final twenty feet and we get our first true summit views. 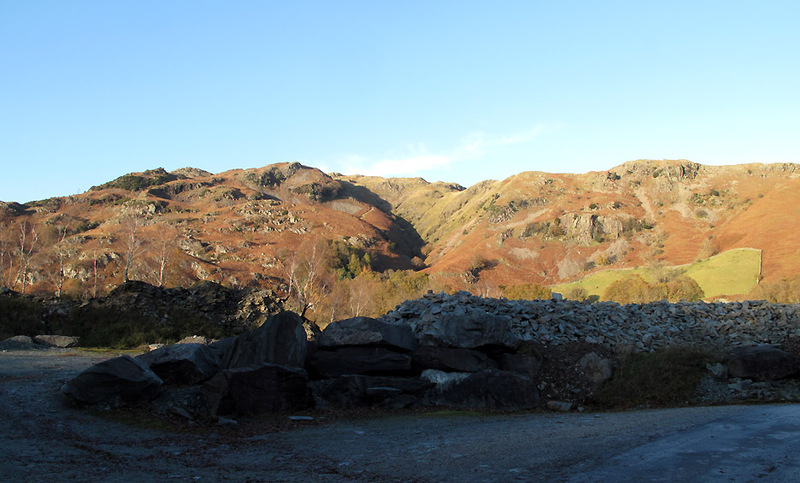 with the deep gash that leads the water down off the fells through Dungeon Ghyll waterfalls. 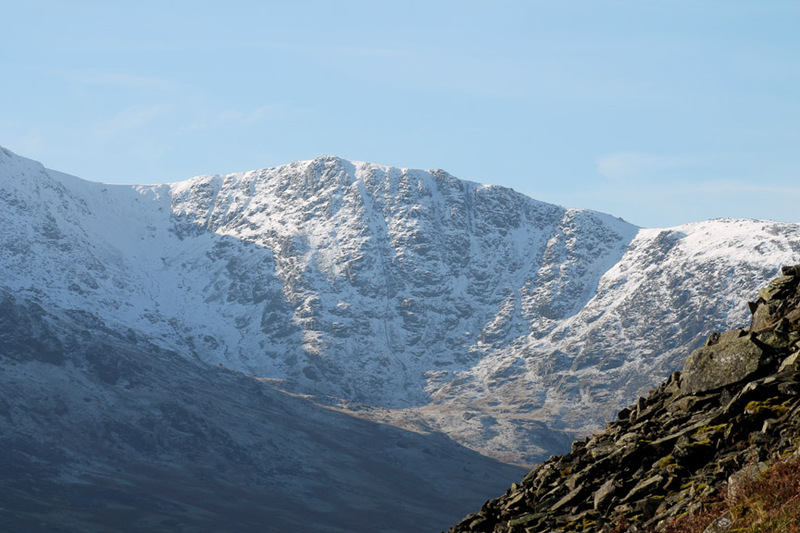 Moving round, the long lens captures The Band and the ascent to Bowfell. as are the two sheep on the bank opposite ! 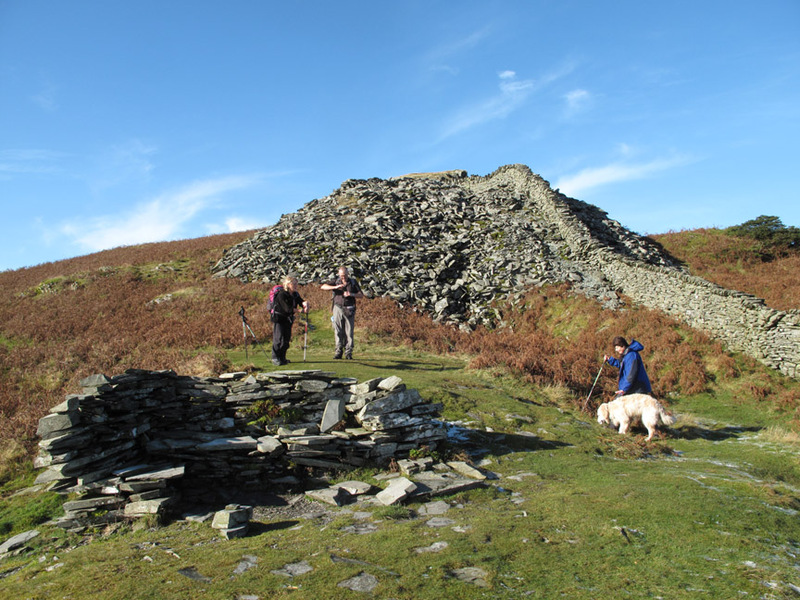 A short walk beyond in order not to hog the summit over lunchtime. This will do nicely . . . the rocks providing some shelter from the slight breeze. Lunchtime view . 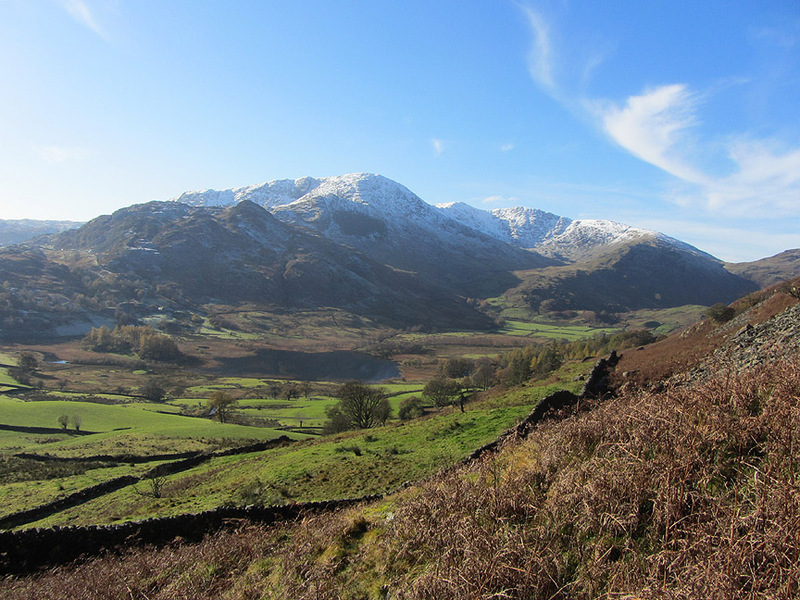 . . looking down the length of Mickleden Valley. 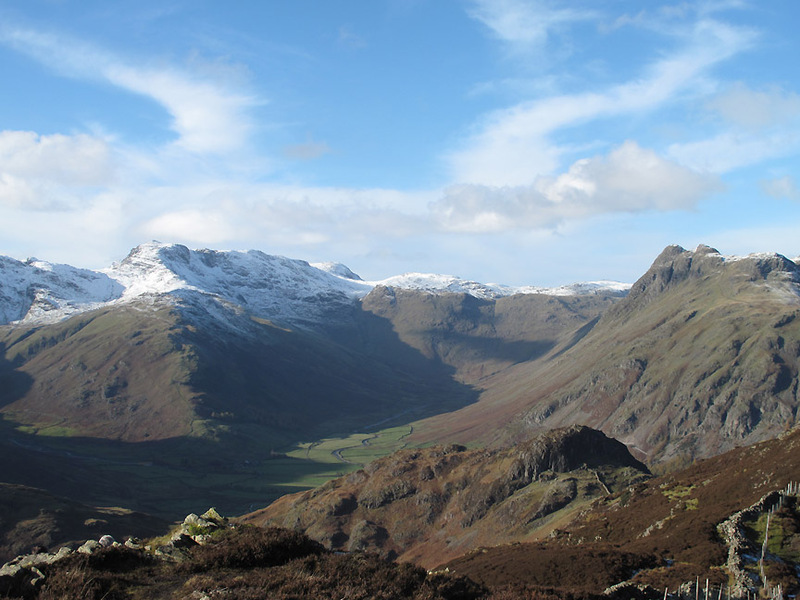 Rossett Pike at the top end has lost most of the snow it presumably gained over the last couple of nights. 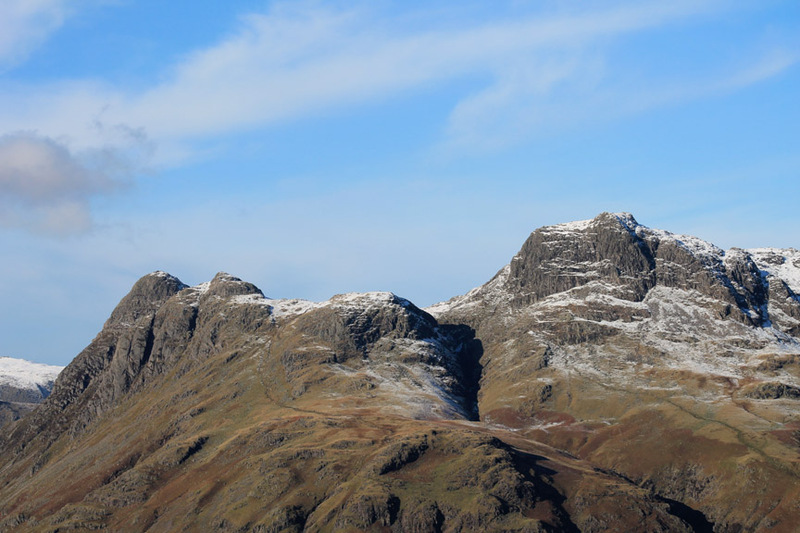 Below is Side Pike and the famous 'squeeze' . . . down and to the left where the wall reaches the vertical crag. Lunch over . 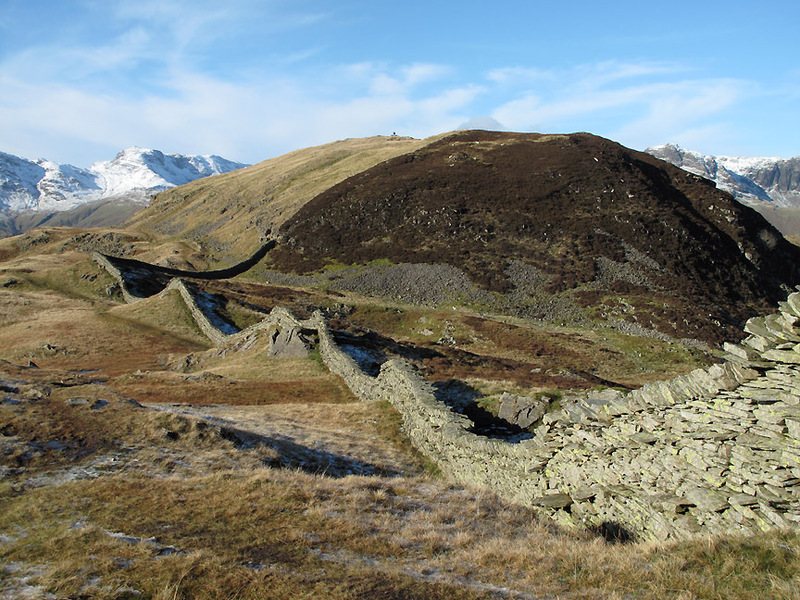 . . we retrace our steps, back past the summit and re-join the wall. 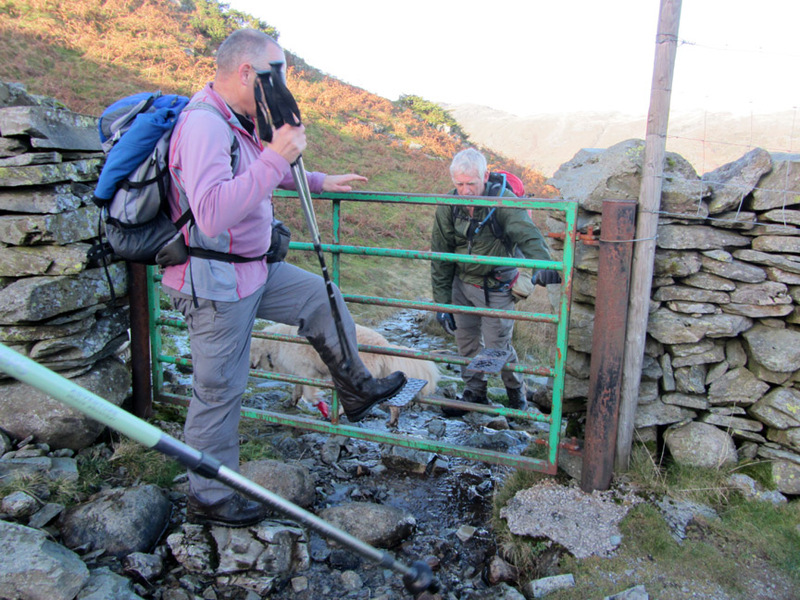 Along the way we were met and recognised by Loweswatercam viewers, Karl and Susan. 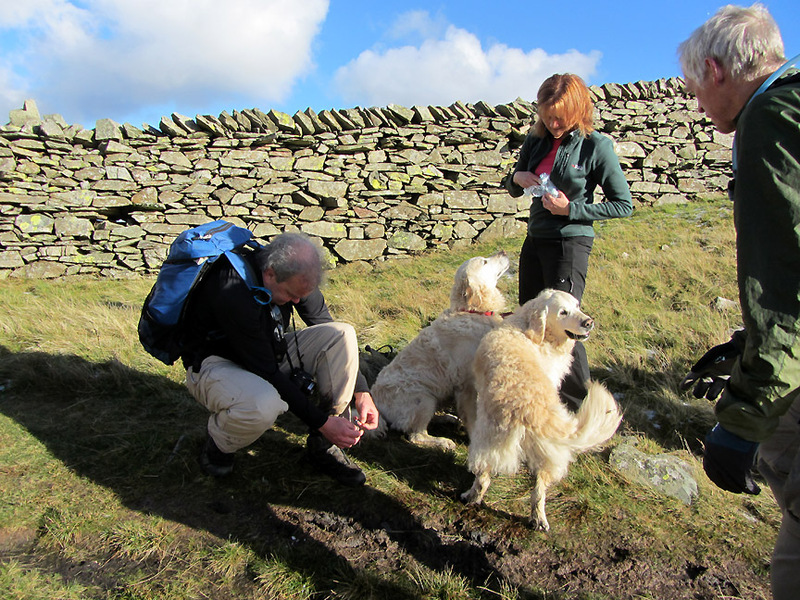 To be fair they recognised the dogs first, having walked with them on a Striding Edge walk a few years back. We were abroad then and Angie had been looking after the dogs . . . 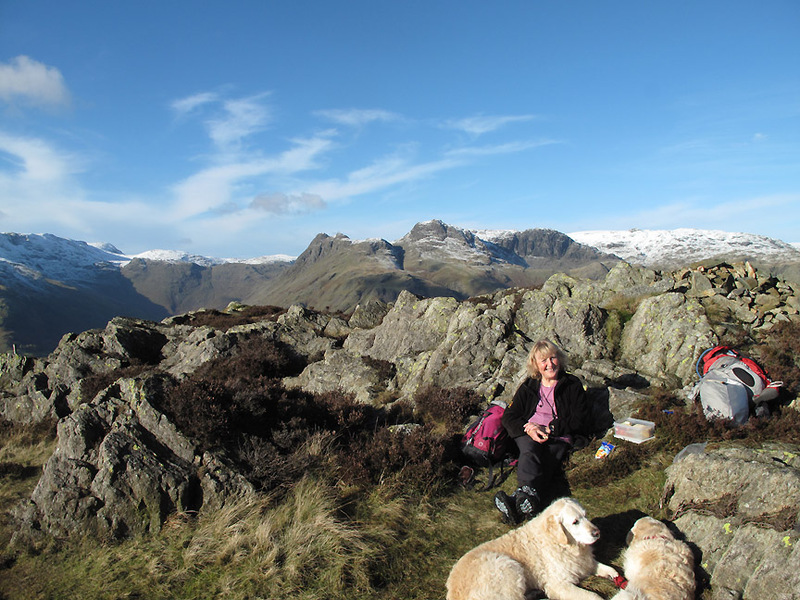 It was the first time Ann and I had met them on the fells. 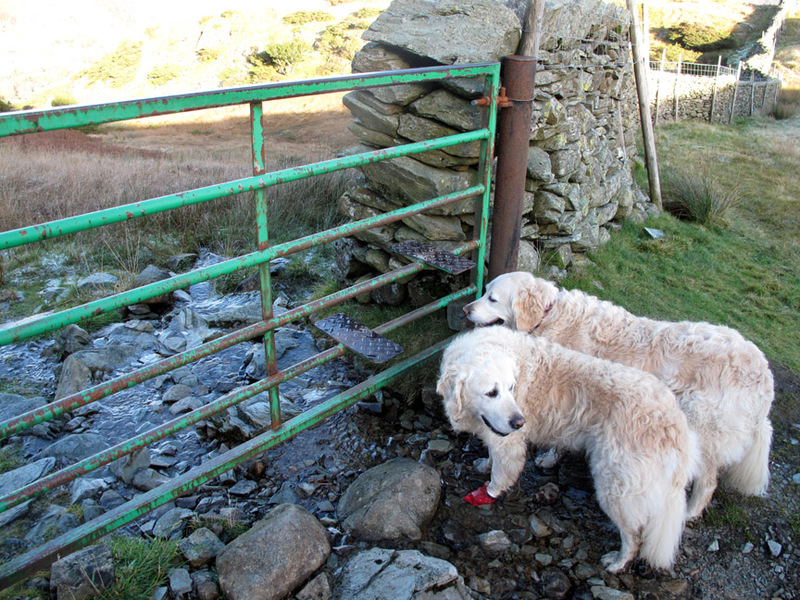 They had planned a walk elsewhere and had changed their mind at the last moment. Some sausages they had been keeping for their friend's dogs were now offered to ours instead. Thanks Sue from us . . . even if the dogs forgot to say thank you in the rush. I seem to be pointing something out to David . . . a very distant passing helicopter if I remember correctly. Seems to be a good place for a three-quarter group photo . . . or 5/6th if you count the dogs ! 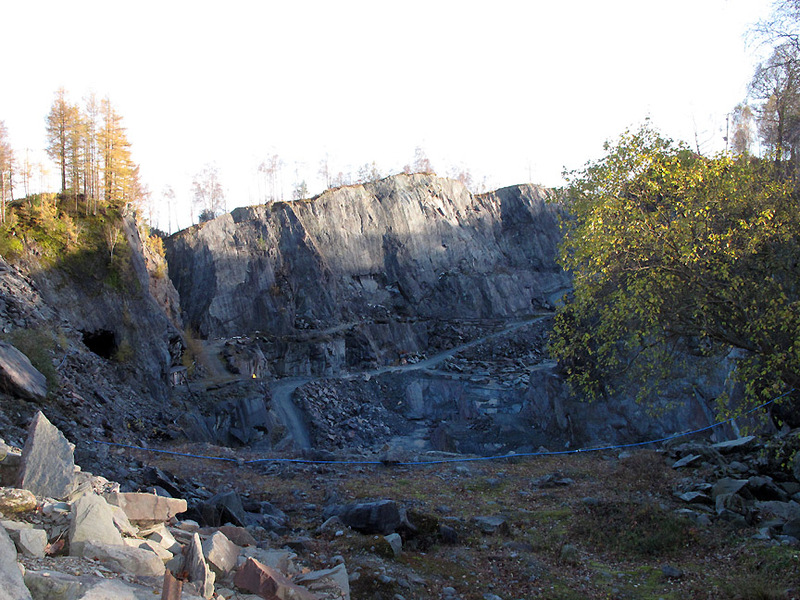 we took the path from just below the chair, down into the lower quarries. The gate was locked . 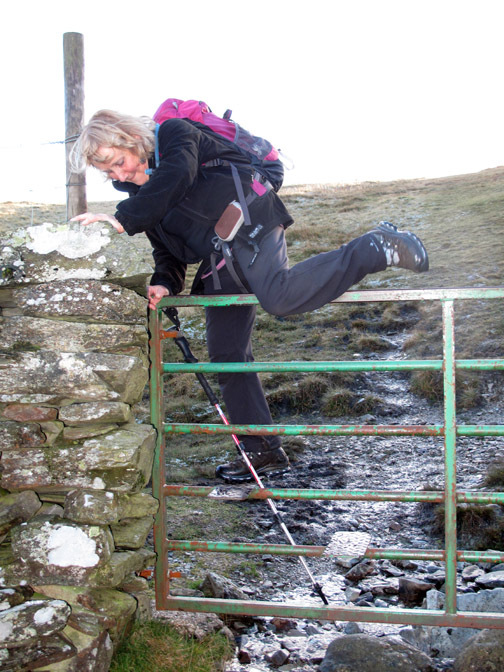 . . but foot-plates make a bit of a stile for people . . . the dogs crawled underneath. 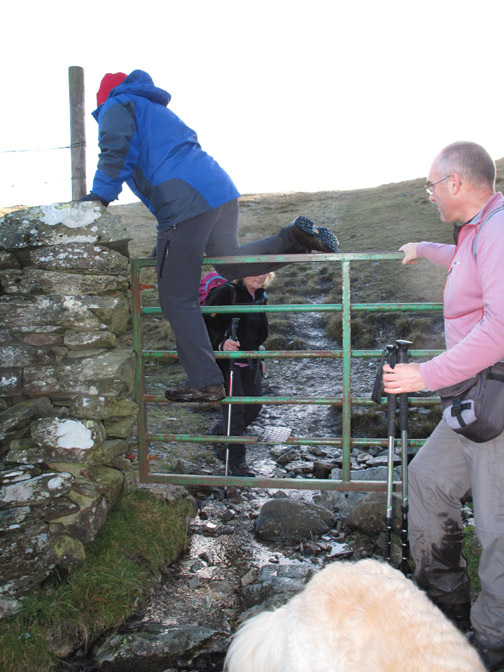 Help David over the stile . . . do you think he will get over ok ? Hold your cursor over the picture to find out. The girls made an easy climb of it too . . .
. . . despite the top rail being a bit higher than it need be. A photographer's nightmare . . . bright sunshine and deep valley shadows. 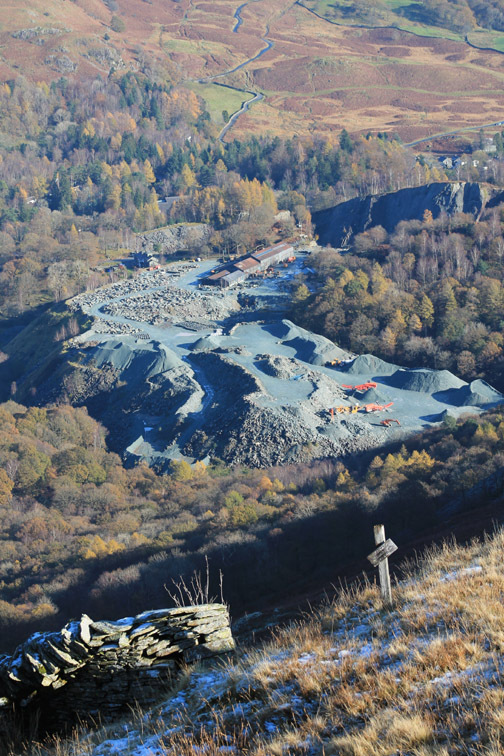 We look down on some of the Spoutcrag Quarries hidden in the trees. 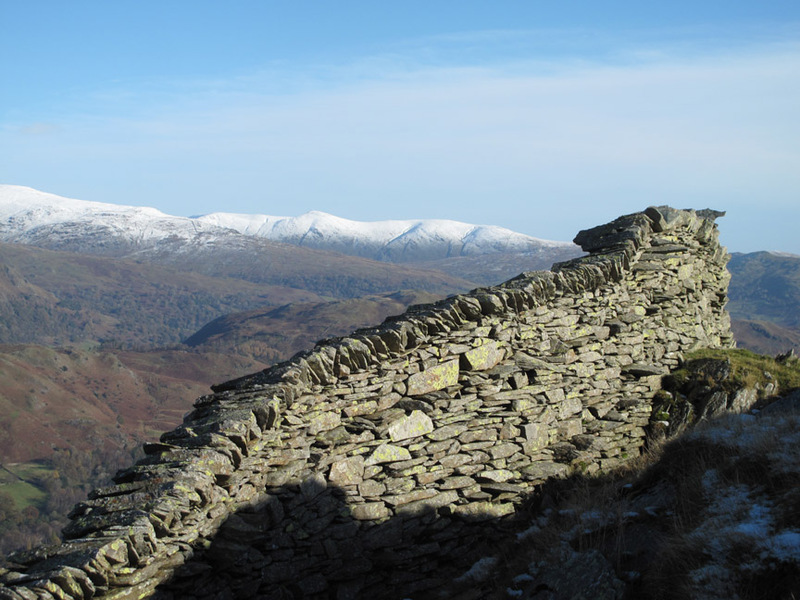 Looking over Chapel Stile again . . . that's a cloud not a helicopter shadow ! Turning, it is time to hurry and catch the others up. Back to the standard lens for this wider view of the descent. 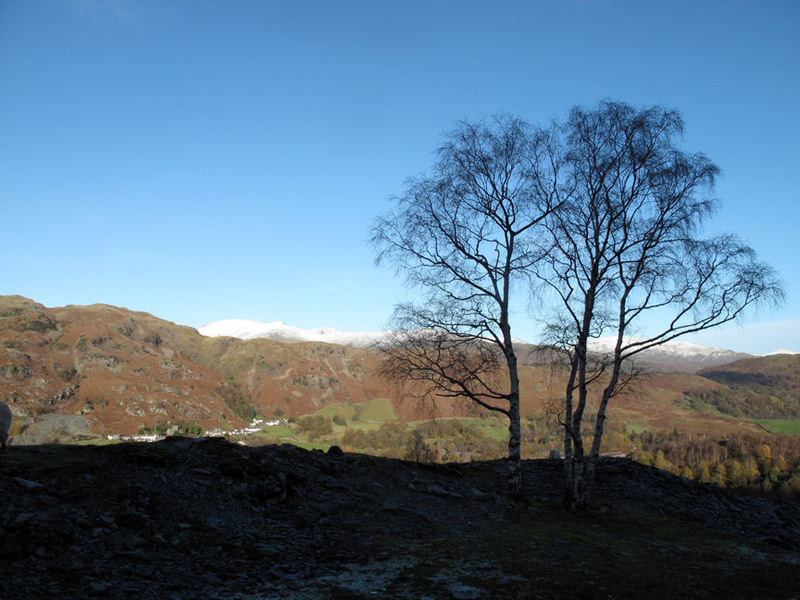 the silver birch is one of the first pioneer trees to self-seed and start to reclaim the old landscape. Down through the woods and across the Baysbrown Wood track. 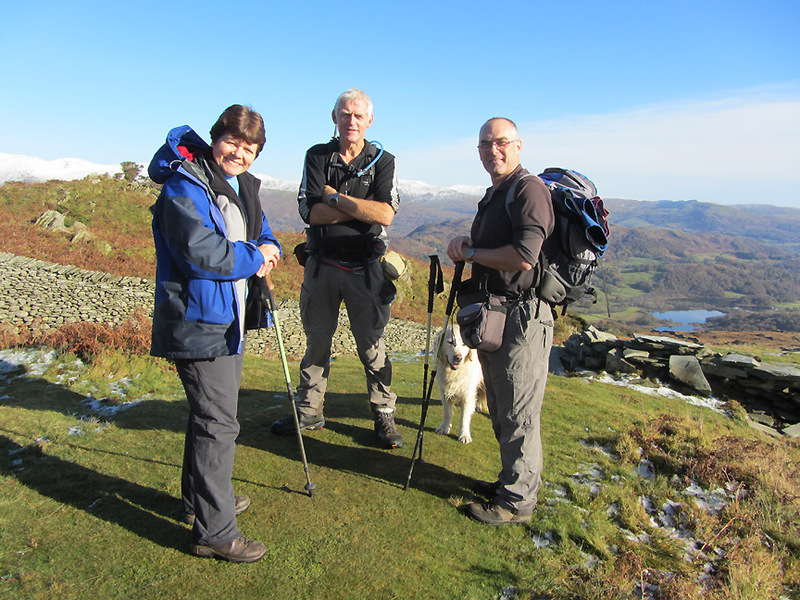 We're now on the bridleway from Dale End, Little Langdale down towards Chapel Stile. 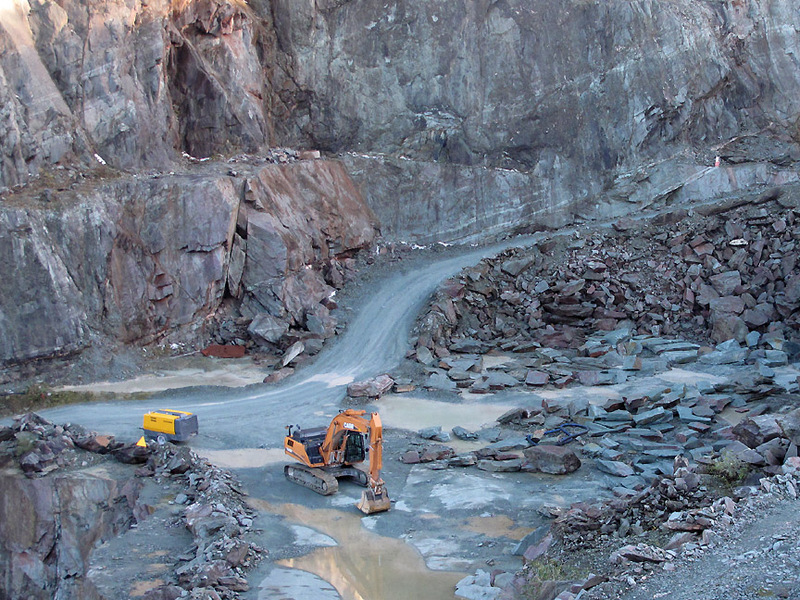 The right of way passes straight through the workshop area of the Burlington Quarries site. Oversize Tonka-toys for the boys. 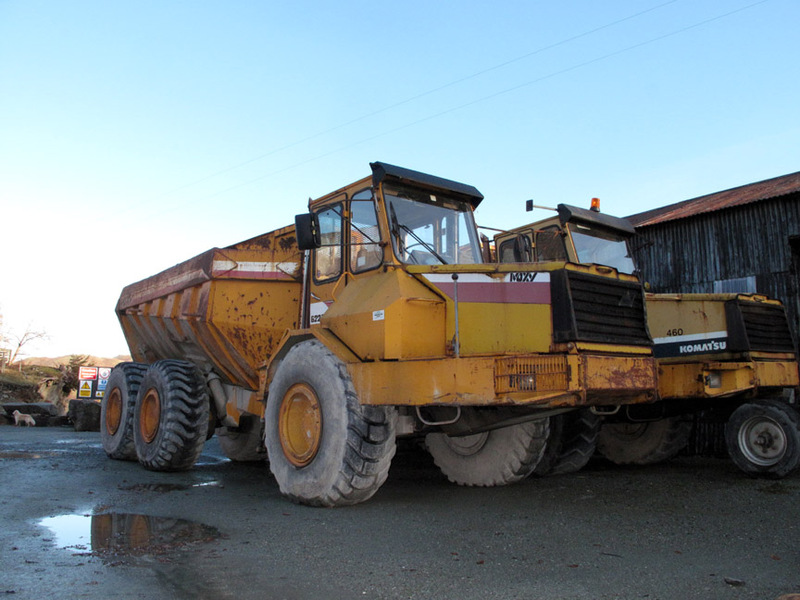 These two are used to transport stone up from the new deep quarry. 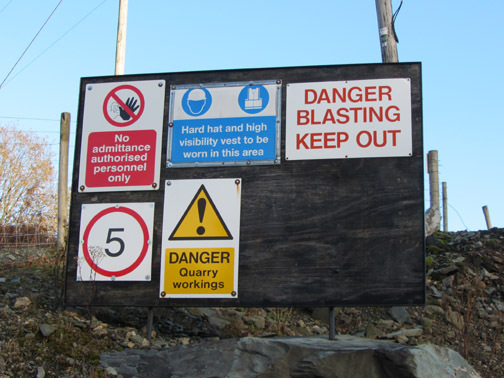 Close up of one of the machines, down in the base of the quarry. Leaving the viewing platform we round the corner . . . and find the excavations continue . . . it certainly was bigger than expected. 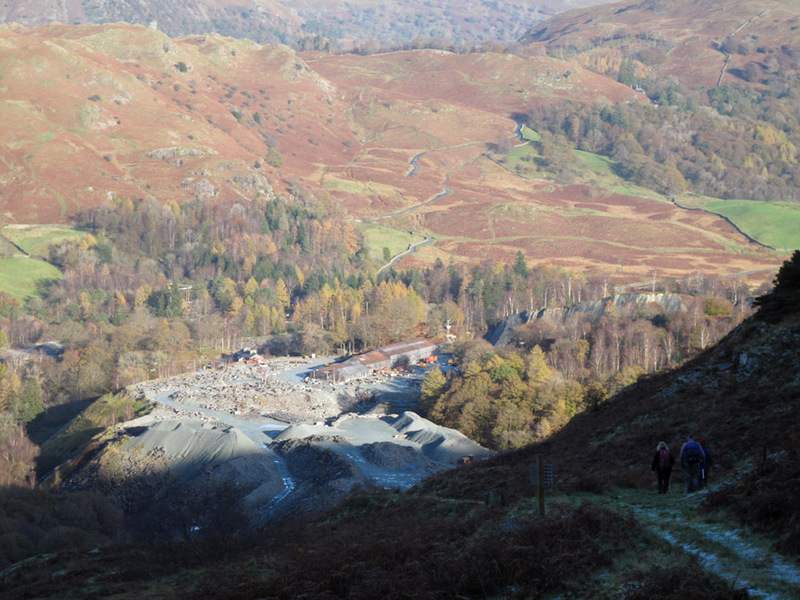 Following the mine road back to the village we get a final view of the Langdale Pikes over one of the quarry houses.
. . . and a view of Silver How and Dow Bank over the spoil heaps. 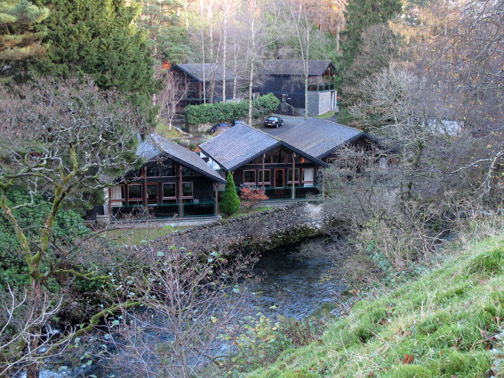 Between Elterwater and Chapel Stile on the main road is the entrance to the Langdale Hotel and Timeshare apartments. You see very little of this well-landscaped development . . .
. . . when passing along the main road. 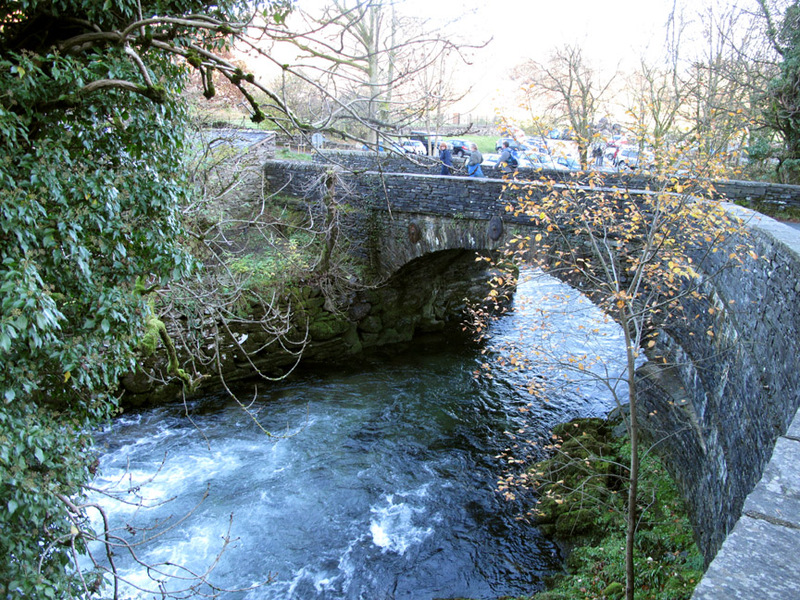 Back now at the bridge over the Langdale Beck that takes us across to the end of the walk. Well . . . you can't pass the Britannia without stopping by for a little hot refreshment on a cool afternoon. This site best viewed with . 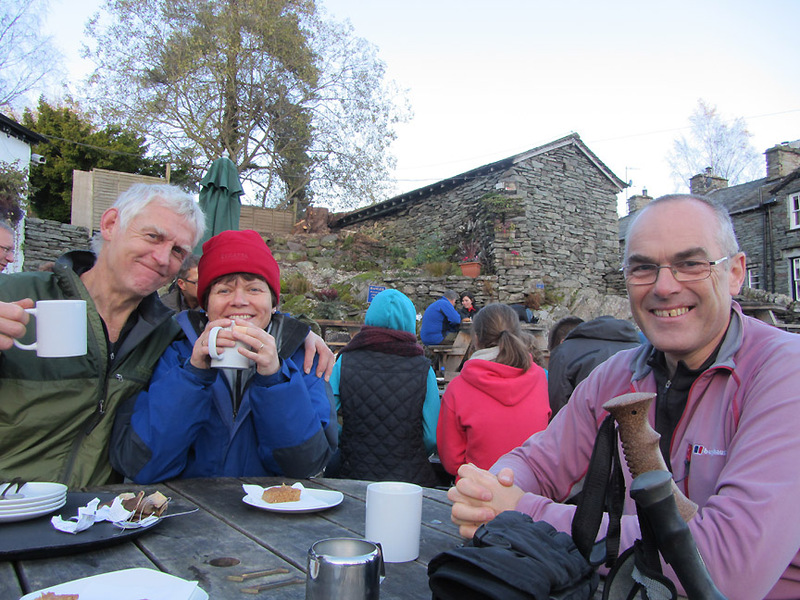 . . tea in a mug, scones and cakes on adjacent plates, simultaneously.